Whether you are doing a job around the house or simply changing a light bulb, you may need a ladder to complete the task. While you may think that every ladder is the same, there are significant differences between a fiberglass vs aluminum ladder. Both have their own advantages and depending on the plans you have for your ladder, you may want to choose one over the other. This aluminum vs fiberglass ladder review will help you narrow down your choice for which type of ladder is best for you. Spoiler alert... unless you are a contractor or electrician, you probably don't need to spend the money on a fiberglass ladder! What is an Aluminum Ladder? When to Use an Aluminum Ladder? What is a Fiberglass Ladder? When to Use a Fiberglass Ladder? ​Heat also has an impact on aluminum and can cause it to lose its durable nature. Aluminum ladders, however, do resist corrosion and can withstand applications where water or moisture is an issue. Aluminum ladders are ideal for ​tasks that require a lot of moving of the ladder itself. Because aluminum is a lightweight material, it can be moved around a job site easily with very little hassle. This can make the task you are working on easier and also helps when loading and unloading when moving all of your tools from job-to-job. ​​In our opinion, unless you are a professional contractor or electrician, aluminum ladders are the way to go. ​Aluminum ladders are much cheaper than their fiberglass counterparts. They are also much lighter than a fiberglass ladder, and you don't need the added features that a fiberglass ladder offers. ​One downside to consider: aluminum conducts ​electricity. Thus, if you use an aluminum ladder around bare wires, or during lightening storms, you risk getting electrocuted. Changing out lightbulbs probably isn't an issue, ​as long as you don't directly touch the electric source. However, wear rubber-soled shoes while doing so, just for extra safety. Related: Other Common Homeowner Questions - Sheetrock vs Drywall? A fiberglass ladder is made entirely of fiberglass or fiber-reinforced plastic that uses glass fibers, allowing it to be quite durable in its design. Fiberglass is a high-grade material that can be used in a variety of temperatures as well as weather elements without degradation. Generally speaking, fiberglass ladders are heavy duty (and heavy in weight). They are highly durable, and often used in professional and commercial environments. ​If you are more of the general DIY'er who does occasional projects, chances are you don't need to fork out the extra cost that a fiberglass ladder is going to cost you. You really don't need the durability and features that a fiberglass ladder brings. Fiberglass ladders are very strong and sturdy. If you're going to be using a ladder to move really heavy objects, you might want to use a fiberglass ladder. Fiberglass ladders are more durable than aluminum ladders. In general, they will last longer and stand up to more of a beating. You would want to use a fiberglass ladder when you are working in high-heat temperatures. The makeup of the fiberglass prevents bending and allows your ladder to retain its integrity without degradation. Fiberglass ladders are also ideal for applications where electricity or electrocution may be an issue. Because fiberglass is not a heat ​inductor, it has resistance to electricity and can help keep you safe should a stray electrical current occur. 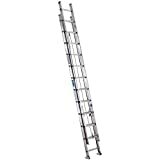 These types of ladders are also flame resistant, which can provide superior protection and prevent burns or fires from starting. Fiberglass ladders are more expensive, more durable, and resist electricity. Aluminum ladders are cheaper and more common. For the general homemaker or DIYer, opt for an aluminum ladder. Aluminum ladders conduct ​electricity, which creates a safety hazard if used in the wrong conditions. If the ladder touches a live wire while on the ground, you could be electrocuted. ​Unless you are a professional contractor or electrician, grab an aluminum ladder. You don't need the added weight and durability that a fiberglass ladder offers, and you won't have to spend a lot of extra money. If you are working with electricity, though, you'll want to consider a fiberglass ladder. This is solely because fiberglass doesn't conduct electricity, which makes it a lot safer. If you are a professional contractor, you might want to add a fiberglass ladder to your arsenal. They are highly durable, and safe to use for ​hoisting heavy lumber and equipment. Buying a ladder might seem like a trivial expense, but if you aren't careful, you can pick up the wrong one. There are several factors to consider when looking at buying a ladder that are very important. By far, the most important consideration when researching a ladder is safety. You need to pay attention to how safe the ladder is, as you'll be relying on it when you standing at the top of the steps. Fiberglass ladders are more sturdy than aluminum ladders, and thus more safe. They are also resistant to electricity. That doesn't mean you can't find a safe aluminum ladder though. Pay attention to the weight rating that the ladder has. You don't want to be putting more weight on the ladder than it was designed for. Look at the ladder's Duty Rating, which is the maximum safe load weight that the ladder can handle. Price is (and should be) a factor to consider when looking at ladder reviews. 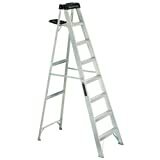 Aluminum ladders are by and large cheaper when compared to fiberglass ladders. If you're looking to save money, you can opt for an aluminum one. However, be careful. There are quite a few cheap aluminum ladders that hold up to a good safety rating. We recommend taking a look at the Louisville Ladder AS3008 8 ft 300-Pound Duty Rating Aluminum Stepladder or the Werner D1224-2 24 ft 225-Pound Duty Rating Aluminum Flat D-Rung Extension Ladder. A step ladder is a short, folding ladder that has several small steps for you to climb. A step ladder is also typically equipped with a small platform near the top, allowing you to set​ other tools down while on the ladder. A step ladder is very portable. It has two sections that quickly fold up onto itself and be moved from location to location. When extended, the ladder makes an inverted V shape, with the two legs resting on the ground and joining together in a point at the top. A step ladder is also very easy to use. It is built with wide, flat steps that are easy to climb and stand on. We're big fans of easy to use and highly portable tools around the house - they just make your projects a lot easier. A step ladder is often confused with a stepping stool. A step ladder is much taller than a stepping stool, and has multiple steps. Typically, step ladders range 4-8 ft high. An extension ladder is basically like two ladders that can be combined into one. The ladder can typically be used like a step ladder, where the two sides fold out into an inverted V shape. The ladder can also be extended into one long piece, and leaned up against a wall. This allows the ladder to "extend", and be twice as long as it was previously. An extension ladder typically isn't as handy as a step ladder. They are bulkier, heavier, and much more awkward to move around. While they have a lot of the same capabilities as the step ladder, they are not nearly as convenient. They also don't usually have nice wide steps, which makes them less safe, especially for children or the elderly. However, extension ladders are fantastic for getting high and accessing hard to reach places. They are great for trimming trees and ​​painting large rooms with high ceilings​​​. Step ladders are great for general work around the house. You can usually reach heights of 4-8ft above the ground, which works for a lot of repairs and projects. They are highly portable and easy to store. Extension ladders are necessary for professional contractors, and they might be necessary for your specific situation. They allow you to reach heights of 10-15ft with ease, which might come in handy for two story homes. However, extension ladders aren't nearly as convenient or portable. They are heavy, and more difficult to store. Unless you have a felt need for a tall ladder, opt for a rugged, sturdy step ladder.